Congratulations to this year’s Reviewer Award Winners! Thirty-five GIE reviewers were recognized for their superior contributions to GIE, both through completing high numbers of reviews and for submitting the highest quality of work. Thank you for donating your time and energy to the peer-review process. Your efforts help to make GIE a success. 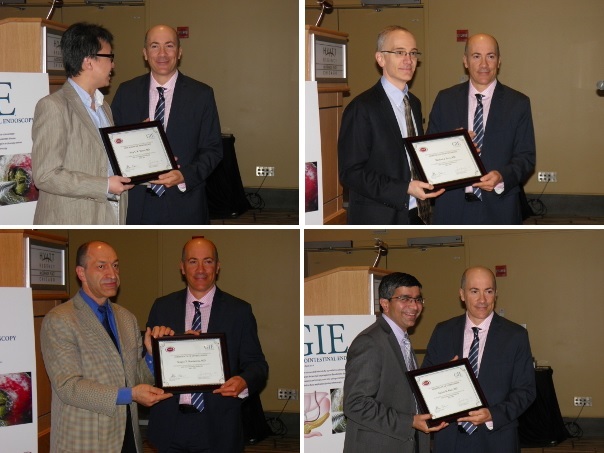 This year’s winners were recognized at the GIE Editors’ Reception during Digestive Disease Week® 2014. Editor-in-Chief Dr. Glenn Eisen presents reviewer winners with certificates of appreciation.